Western blot analysis of extracts from various cell lines using AKAP1 (D9C5) XP® Rabbit mAb. Confocal immunofluorescent analysis of MCF7 cells using AKAP1 (D9C5) XP® Rabbit mAb (green) and β-Actin (8H10D10) Mouse mAb #3700 (red). Blue pseudocolor = DRAQ5® #4084 (fluorescent DNA dye). 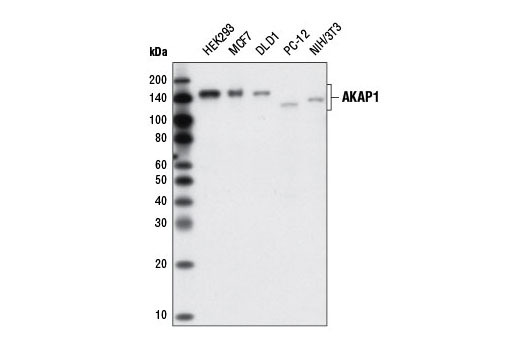 AKAP1 (D9C5) XP® Rabbit mAb recognizes endogenous levels of total AKAP1 protein. 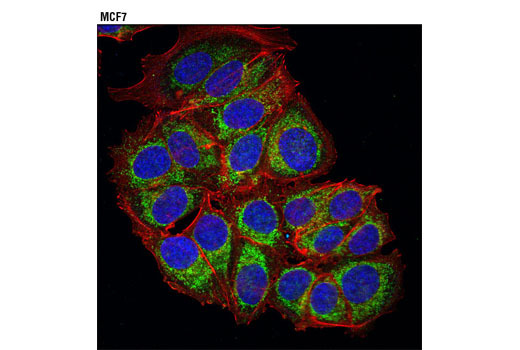 Monoclonal antibody is produced by immunizing animals with a synthetic peptide corresponding to residues surrounding Val630 of human AKAP1 protein. AKAPs (A-kinase anchoring proteins), as their name implies, are a family of scaffolding proteins that bind regulatory subunits of Protein Kinase A (PKA) thus localizing PKA activity to distinct regions of the cell (1). Beyond a common amphipathic alpha-helix which is responsible for recruiting the PKA regulatory subunit (RIα, RIIα, RIβ, or RIIβ), individual AKAPs contain additional domains responsible for the recrutiment of additional signaling proteins (phosphodiesterases, phosphatases, cytoskeletal components, other kinase, etc.) or restricting the AKAP to a specific subcellular location (1). AKAP1, also known as AKAP149 in human, AKAP121 in rat, or D-AKAP in mouse is a dual-specificity AKAP which can bind to both RI and RII subunits of PKA with similar affinity (2,3). Originally thought to be predominantly restricted to the mitochondria, growing evidence suggests that localization of AKAP1 can be regulated in part by alternative splicing events and that AKAP1 may be present in the endoplasmic reticulum-nuclear envelope membrane network (4-6). Peri-nuclear localization, along with the fact that AKAP1 interacts with RNA via one of two nucleotide-binding domains (K homology (KH) and Tudor) have lead some to suggest that AKAP1 may play a role in RNA metabolism (7,8). In addition to PKA-RI and -RII, AKAP1 directly interacts with PP1 in a phosphorylation dependent manner and nucleates a complex containing PP2Ac, PKA and RSK1 which modulates RSK1 localization and activity (9-12). Herberg, F.W. et al. (2000) J Mol Biol 298, 329-39. Huang, L.J. et al. (1997) J Biol Chem 272, 8057-64. Cardone, L. et al. (2002) J Mol Biol 320, 663-75. Ma, Y. and Taylor, S. (2002) J Biol Chem 277, 27328-36. Ma, Y. and Taylor, S.S. (2008) J Biol Chem 283, 11743-51. Trendelenburg, G. et al. (1996) Biochem Biophys Res Commun 225, 313-9. Rogne, M. et al. (2006) Biochemistry 45, 14980-9. Chaturvedi, D. et al. (2009) J Biol Chem 284, 23670-81. Chaturvedi, D. et al. (2006) Mol Cell Biol 26, 4586-600. Küntziger, T. et al. (2006) Biochemistry 45, 5868-77. Bridges, D. et al. (2006) Biochem Biophys Res Commun 346, 351-7.